From its current UNIQLO deal, to its Vans deal from 2016, Nintendo’s third party clothing has been absolutely fantastic in fashion, quality, and even pricing. Following Nintendo’s announcement they would be pairing up with UNIQLO to sell a line of graphic-tees for 14.90 dollars per, (stores like Urban Outfitters sell tees for mostly 30-40 dollars) I initially thought we would be getting the usual cheap cash-in from a game company, because most quality clothing with video game inspirations are stupidly expensive and pretentious as can be. Here’s a nearly 300 dollar Deus Ex trench coat that looks like a drunk fashion designer tried to make a windbreaker, or Konami’s 485 dollar Hideo Kojima brand glasses, which totally wasn’t scummy. Speaking of fashion, they’re some really nice shirts, visually and in terms of how they’ve been made. The designs are stellar, with the above image showing only a few of the awesome designs. Some of the women’s shirts are really cool too, especially the Princess Peach parody of Roy Lichtenstein’s famous Drowning Girl. 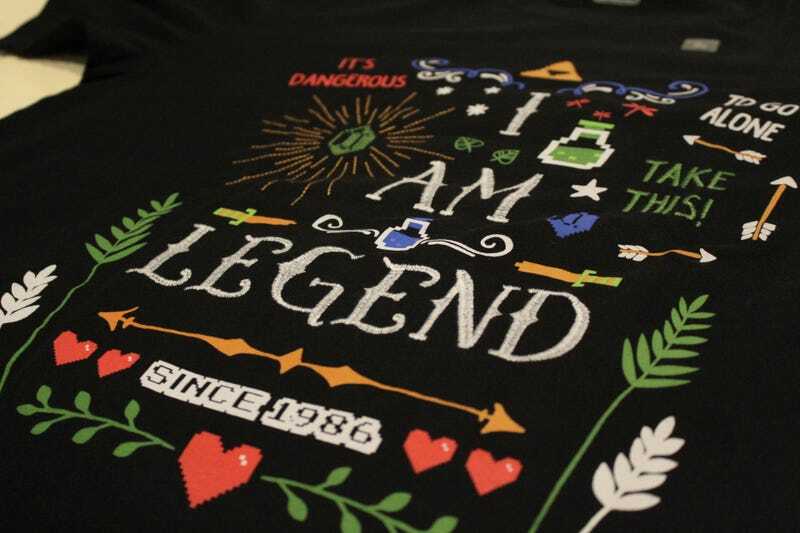 The stitching on each of the shirts is expert, and the designs are really intricate but not too complicated that it looks like a jumble of images. Press the magnifying glass in the top left of the image for a better look. I thought with all this heavy stitching, and thick designs on the shirts, I was worried it would be uncomfortable, like I’m wearing a poster made of cardboard on my chest instead of a shirt. But no, the shirts are really comfortable, made from 100% cotton. Since they’re 100% cotton they’re either going to be tougher for you to get washed, or much easier, depending on your wardrobe of course. Likewise to the shirts, I can say nothing but good things about my Nintendo Vans. They’re stylish, colorful, and actually fit with just about any outfit I have. They’re Vans too, so anyone whose ever bought a pair from them knows they’re comfy, despite the lack of support which frankly isn’t necessary because if you have the money to buy shoes which sell out in about 3 hours, you probably also have enough to buy some cheap sneakers if you need them. They may look a little worn in. That’s what happens when you wear shoes every other day for a year straight I guess. When you can spend 400 USD on “Chun Li” style Nike sneakers, buying high-top SK8 shoes for 80 dollars is honestly a deal. Most nice shoes, even some less nice or comfortable shoes, cost much more than what Nintendo was selling. Sadly, Nintendo sold a stupidly small amount of them per Nintendo tradition, and you can be sure if Nintendo fans didn’t buy them all, sneaker nuts will. However, seeing as UNIQLO has been doing a great job keeping its Nintendo line in stock, it seems like Nintendo learned its lesson in intentionally selling as few of its great products as possible. This means we can expect great future deals like the Vans shoes to actually last. If you were on the fence for buying any of the shirts from UNIQLO’s Nintendo line, this is a wake up call because they are absolutely worth it. They’re fairly cheap, look great, and feel as comfortable as expensive designer clothes.